This a Diamond Knurl Ballpoint Pen. It is made of an acrylic pen blank containing holographic tape. This gives the barrel a 3 dimensional or kaleidoscope effect. It is a very stylish pen. If you are searching for pretty pens, you have definitely found one. 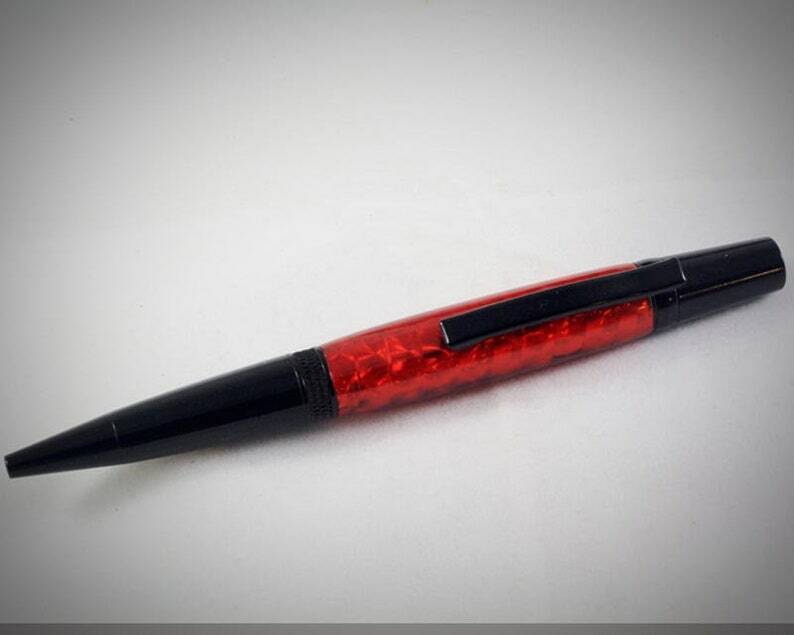 I believe that this pen would make a wonderful gift to anyone, for any occasion. Also, remember that there is nothing wrong with you treating yourself to a special pen every now and then. Life is too short to write with an ordinary, boring pen. Packaging: This high quality pen comes packaged in an Ohio Penworks pen box. First the pen blank was made by wrapping strips of holographic tape to a brass tube. The tube was then cast in clear resin. The tape catches the light and sparkles, giving the pen a three dimensional appearance. Both ends of the cast tube were sanded flush to the brass tube. Then I mounted the pen blank onto a wood lathe. Using hand tools, I turned the blank down to it's final shape making certain that the ends of the blank were just the right size to match up to the components of the pen. I then sanded and polished the blank to an crystal clear finish. I then attached the components to the pen blank with a special press and a small drop of adhesive.